The social media world is constantly changing. It can be hard to keep up with all of the latest features and policy changes, so we’ve made it easy for you to stay up to date by creating a monthly roundup of what’s new on Facebook, LinkedIn, Instagram, and Twitter. This month, Facebook added new features to Groups, while LinkedIn spruced up their hiring tools. Meanwhile, Instagram started to push its spin-off app, IGTV, a little more, and Twitter began testing a host of new features to help make conversations flow better than ever. 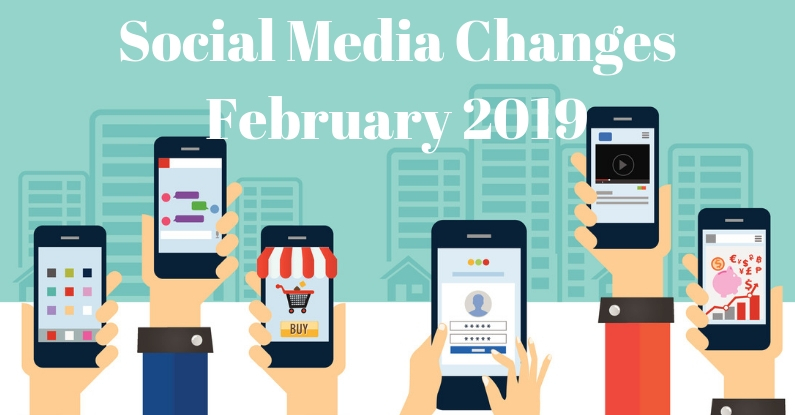 Read on for more noteworthy social media changes that happened in February 2019. In their latest update for Groups, Facebook added new post formatting tools for administrators, along with new tools to help admins manage their Groups. These new features include tools for informing members when they violate a rule, the ability to filter content in their admin activity log by date, and the ability to search through membership requests by name. The platform is also said to be launching a new pilot program that will allow Groups to collaborate with brands and will also allow Facebook Pages to join and participate in Groups. Other changes in the cards for Groups include the expansion of Group subscriptions to more partners and the expansion of the Group mentorship program to all Facebook Groups. There’s going to be a big shift in Facebook advertising this year! According to Search Engine Journal, starting September 2019, all ad campaigns will be transitioned to “campaign budget optimization,” which will give advertisers “one central campaign budget across all ad sets.” With just one budget for a campaign, Facebook will then “automatically distribute the budget to top performing ad sets” to generate the best results while saving costs and time for advertisers. 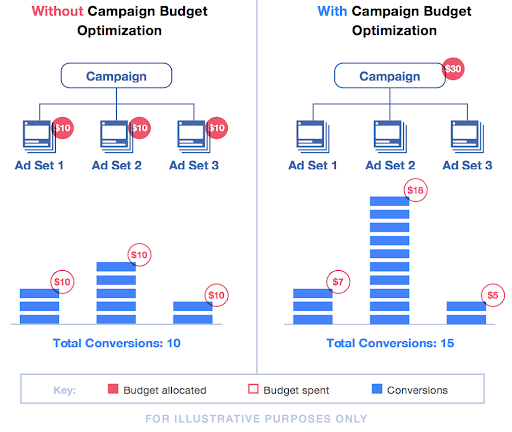 Right now, optimizing your budget is optional, and advertisers can set budgets for each individual ad set. With this change, optimization cannot be turned off and will apply to old and new campaigns. Starting this month, Android users will finally have more control over how Facebook tracks them and stores their personal information. With a new update to Android’s location controls, you can now choose if you want to allow Facebook to continue collecting location information about you even when you’re not using the app. Before, when location history was enabled, you would share your location even when not using the app, which allowed Facebook to store a history of your precise locations. If you’re an iOS user, don’t worry — these controls already exist for you! Finding job candidates or jobs will soon be easier than ever with LinkedIn’s new platform, Intelligent Hiring Experience. Tools like LinkedIn Recruiter, LinkedIn Jobs, and Pipeline Builder will soon be moved to the new platform to streamline the job/candidate hunting process. LinkedIn has also introduced new additions to LinkedIn Groups this month. The platform is starting to roll out a feature that will compile Group notifications into a single update so that Group notifications don’t clog up notification feeds. Also coming up in Groups is the ability for admins to notify members of important conversations happening in their Group and a new process for admins to review and approve posts for “a proactive way to ensure that the content which gets shared in their groups is relevant and valuable.” Also coming soon . . . cover images! You’ll soon be seeing more of Instagram’s spin-off app, IGTV, in your Instagram feed. With a new update this month, users will start getting videos from IGTV in their main feed among regular posts. These IGTV posts, however, will have a tag to identify them, and users won’t see any videos from people they aren’t following — unlike in the actual IGTV app. Another new feature to watch for is the ability to use Direct Messaging on your computer! Instagram is said to be testing a new feature that will let users use Instagram’s DM feature on the desktop version of its site, which as of now remains rather limited, with no option to upload photos or message others. Ever dream of becoming a talk show host? Well, now with Twitter’s latest addition to its livestreaming app, Periscope, you can live out your dream! This month, Twitter added a feature that helps users become more interactive with their viewers by inviting them to join their livestreams. As of now, you can add up to three guests at one time in addition to the host, and if any guests leave, the host can replace them with other users. That’s it for now! We’ll be back next month with more social media updates. In the meantime, you can find our full social media changes report for February 2019 on AdvisorU.